The annual report acknowledges gifts from our alumni, students, parents, friends, faculty, staff, corporations, foundations and other organizations received by Norwich University; each report is from June 1 - May 31, of that fiscal year. The report is compiled by the staff of the Development and Alumni Relations Office. The names that appear under each class year reflect gifts of cash, securities and other appreciated assets, matching gifts, planned gifts and in-kind contributions. For more information on making a gift to Norwich, visit our website at www.alumni.norwich.edu/GiveNow, email development@norwich.edu or telephone the Development and Alumni Relations Office at (802) 485-2300. The names of contributors and board volunteers who passed away during the fiscal year of the report appear as “(Deceased)”. In addition, gifts made in memory of members of the Norwich family appear in the section titled “Memorial Gifts". This annual report acknowledges gifts from our alumni, students, parents, friends, faculty, staff, corporations, foundations and other organizations received by Norwich University between June 1, 2017 and May 31, 2018. The report is compiled by the staff of the Development and Alumni Relations Office. This annual report acknowledges gifts from our alumni, students, parents, friends, faculty, staff, corporations, foundations and other organizations received by Norwich University between June 1, 2016 and May 31, 2017. The report is compiled by the staff of the Development and Alumni Relations Office. This annual report acknowledges gifts from our alumni, students, parents, friends, faculty, staff, corporations, foundations and other organizations received by Norwich University between June 1, 2015 and May 31, 2016. The report is compiled by the staff of the Development and Alumni Relations Office. This annual report acknowledges gifts from our alumni, students, parents, friends, faculty, staff, corporations, foundations and other organizations received by Norwich University between June 1, 2014 and May 31, 2015. The report is compiled by the staff of the Development and Alumni Relations Office. This annual report acknowledges gifts from our alumni, students, parents, friends, faculty, staff, corporations, foundations and other organizations received by Norwich University between June 1, 2013 and May 31, 2014. The report is compiled by the staff of the Development and Alumni Relations Office. This annual report acknowledges gifts from our alumni, students, parents, friends, faculty, staff, corporations, foundations and other organizations received by Norwich University between June 1, 2012 and May 31, 2013. The report is compiled by the staff of the Development and Alumni Relations Office. 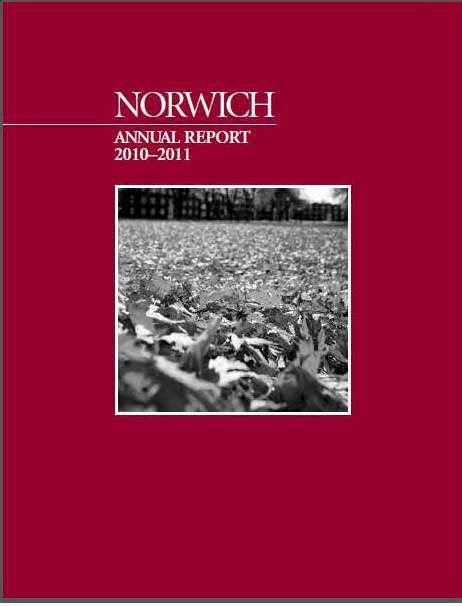 This annual report acknowledges gifts from our alumni, students, parents, friends, faculty, staff, corporations, foundations and other organizations received by Norwich University between June 1, 2011 and May 31, 2012. The report is compiled by the staff of the Development and Alumni Relations Office. 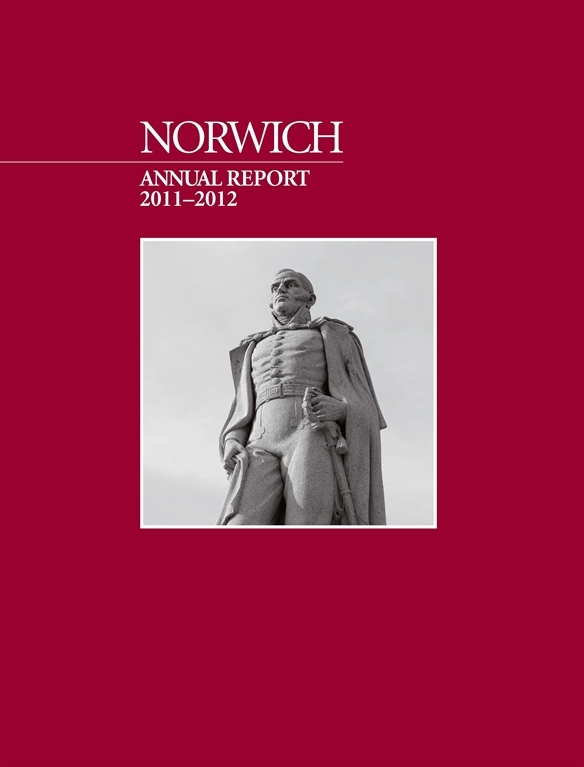 This annual report acknowledges gifts from our alumni, students, parents, friends, faculty, staff, corporations, foundations and other organizations received by Norwich University between June 1, 2010 and May 31, 2011. The report is compiled by the staff of the Development and Alumni Relations Office. This annual report acknowledges gifts from our alumni, students, parents, friends, faculty, staff, corporations, foundations and other organizations received by Norwich University between June 1, 2000 and May 31, 2010. The report is compiled by the staff of the Development and Alumni Relations Office. 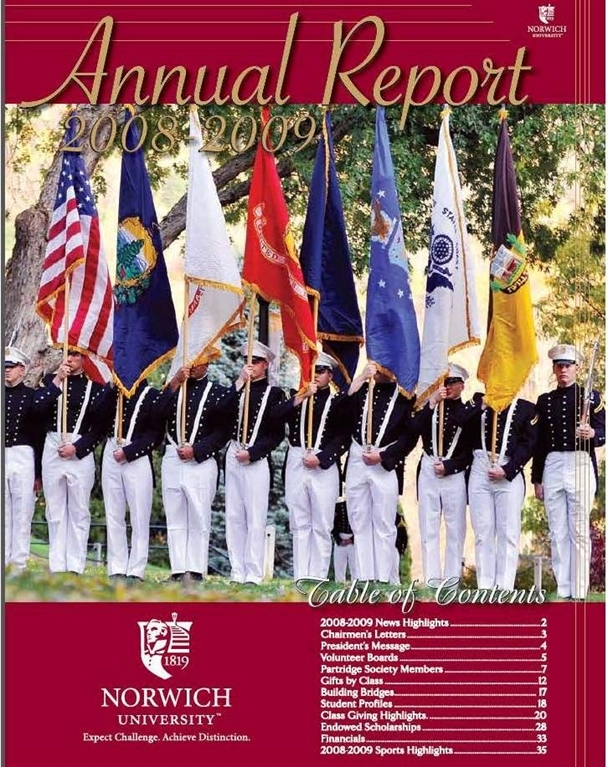 This annual report acknowledges gifts from our alumni, students, parents, friends, faculty, staff, corporations, foundations and other organizations received by Norwich University between June 1, 2008 and May 31, 2009. The report is compiled by the staff of the Development and Alumni Relations Office. This annual report acknowledges gifts from our alumni, students, parents, friends, faculty, staff, corporations, foundations and other organizations received by Norwich University between June 1, 2007 and May 31, 2008. The report is compiled by the staff of the Development and Alumni Relations Office. 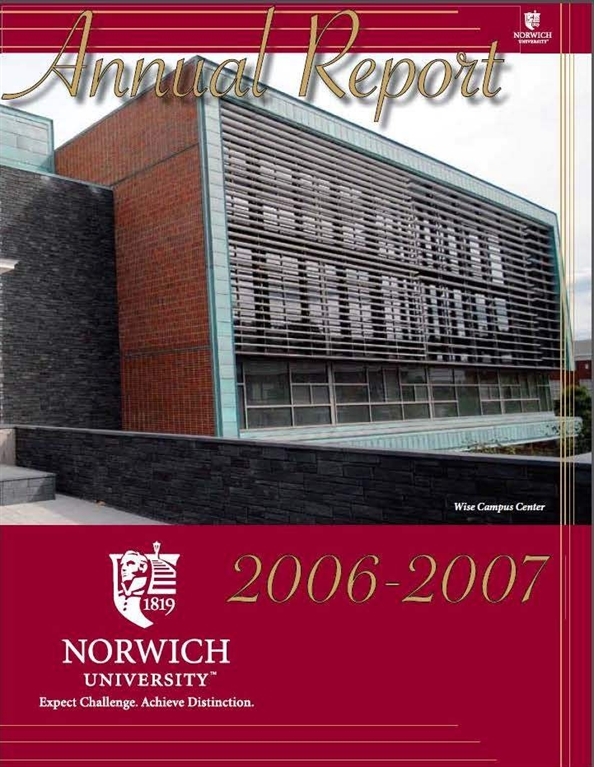 This annual report acknowledges gifts from our alumni, students, parents, friends, faculty, staff, corporations, foundations and other organizations received by Norwich University between June 1, 2006 and May 31, 2007. The report is compiled by the staff of the Development and Alumni Relations Office.